Bradley Palmer’s love for music was discovered at a young age, specifically when she was 3, she sang at a pre-school ceremony. After informing her father, attorney Jack Bradley, that she wanted to do that for the rest of her life, she set out for a life filled with music. Bradley Palmer became an opera singer until the age of 20, in which she sang music from Beethoven and Mozart to Pat Benatar. While in college, she went on vacation with her friends in Vienna, Austria, and one of her friends brought a guitar. She remembered that her guitar was at home, and once she returned from Vienna, she went home to pick it up, and was inspired by the songs her friend played. “It was an exciting experience, a real Hollywood experience,” Bradley Palmer said. She said she was able to go to many awards shows with Bonaduce and got to hang out with Hulk Hogan at the VH1 Music Awards show. After several years in Los Angeles, Bradley Palmer decided she wanted a change. “It came to a point I wanted to give back,” she said. Bradley Palmer moved back to the Cleveland area and started volunteering at University Hospital’s Rainbow Babies and Children’s Hospital. While there, she found out that Cleveland State University had a two-year music therapy program. Her work in music therapy led her to conduct a study at University Hospitals that found music therapy lessened anxiety for women undergoing surgical breast biopsies for cancer treatment and diagnosis, according to an earlier Morning Journal story. The study was published in the Journal of Clinical Oncology in August 2015. The path she has followed in life has given her life lessons that she keeps close to her heart. For example, while in Los Angeles working with Bonaduce, she said she learned that there are many joys and downfalls in Hollywood and she wanted to have normalcy in her life. 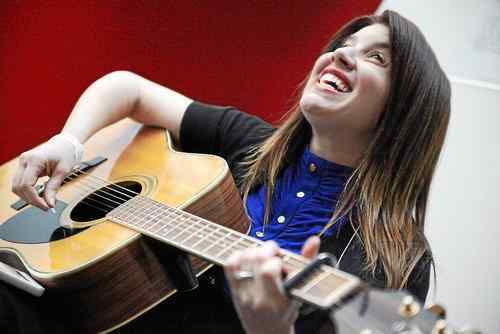 This led to her pursuit of music therapy and the many friends she has made, she said. Bradley Palmer is currently living in the Netherlands with her husband, Oliver, and daughter, Roma Palmer. Her husband was assigned an engineering job and is stationed there until the end of 2017. When she returns to Ohio, she said she wants to continue working with University Hospitals to research and further cement the music therapy field as an evidence based profession. I want to write more music and help my daughter find her life’s song,” Bradley Palmer said.